Parking is to the west of the building. Parking is also available on the street. We have space for private parties. Please call for details about booking. Niche is a modern eatery with a neighborhood cafe feel. We specialize in local, sustainable food and feature the best seasonal offerings. Our menu ranges from small plates to chef-styled main courses and unique desserts. The atmosphere is relaxed and the service friendly. We believe in the philosophy of simple ingredients prepared fresh to showcase flavors. We are able to accommodate special requests and diets and are vegetarian and vegan friendly. Please join Caffe Niche for our special Easter Buffet! The price is $35 for adults and $15 for children and runs from 9am to 3pm. One of our favorite places! We can always count on an excellent meal and a quiet conversation. Waitress was so rude.....she spilled hot scalding coffee on one of the ladies .... Didn't even say sorry. Coffee cake to die for. Niche breakfast the best in SLC. Niche is a terrific neighborhood restaurant. Excellent meal and very nice atmosphere, I recommend. We enjoyed a chance to enjoy each other’s company and the delicious food. We could hear each other! I had the special shrimp and avocado goddess salad, recommended by our server. Delicious! He also recommended a good wine. Niche four times. The food is extraordinary and always very tasty— beautiful healthful ingredients cooked to perfection and an excellent mixture of gourmet and down-home. We have a problem with restaurants where the music is so loud that you can’t have a conversation in a normal voice. This is not a problem at Niche. Friendly in so many ways, I highly recommend this place!!! High quality food that was very tasty. The shepherds pie special was awesome and my wife fully enjoyed the mahi mahi. Service was attentive but not hovering and atmosphere was delightful. Cafe Niche has consistly great food and wonderful food. Their Thai salad is slways wonderful and highly recommended. Great waiters! Charming atmosphere. Lemon saffron cream sauce on the shrimp and pasta dinner special was spectacular. Breakfast is healthy and delicious, with an excellent cappuccino. 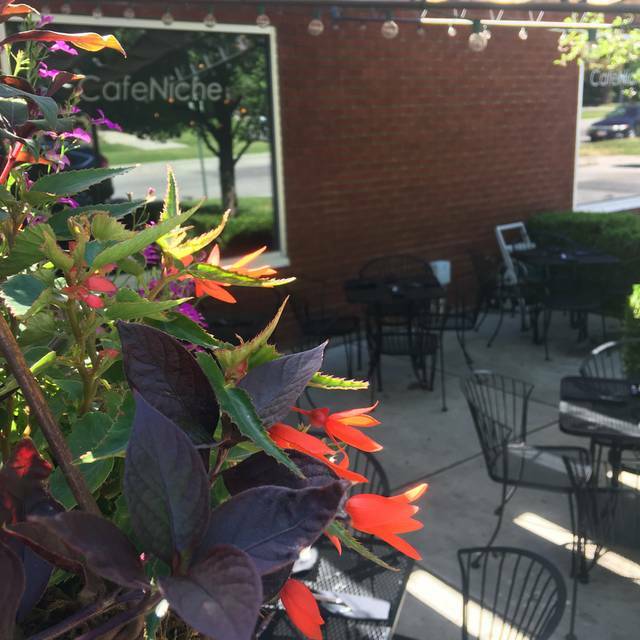 Cafe Niche is a neighborhood gem. A serious candidate for the best restaurant in Salt Lake City. Second time there and I’ll keep coming back. Five star restaurant. I am never disappointed in my dining experience. 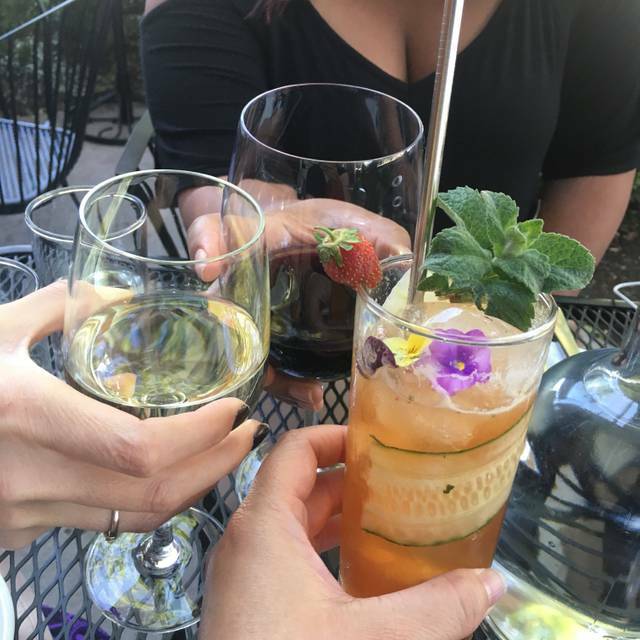 Everything on the menu is savory and delicious; the staff is exceptional; and the ambiance is great for any occasion. Maybe the best clam chowder in the city! Comfortable atmosphere. Great service and fabulous food. Good food, great service, friendly staff and warm atmosphere. So disappointed with the menu and with the Ahi! It has always been a favorite spot of ours. We took friends last weekend and it wasn’t the same! Great waiter though. We were greated by the hostess wishing us a Happy anniversary. The servers mentioned it as well. It was our third time celebrating here and it was the best yet. Thanks to all who helped make our day special! Attractive neighborhood café feel. Attentive service. Excellent salads. Noise level a bit loud for quiet one-on-one conversation, especially in the back. Caffe Niche never disappoints. 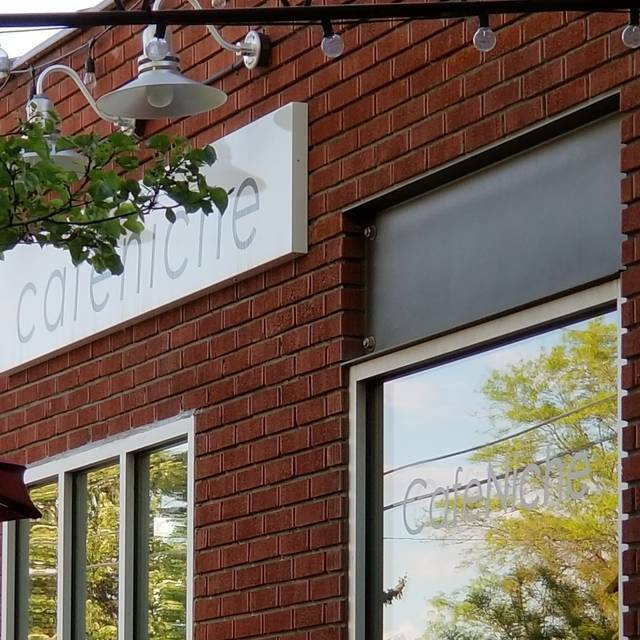 We go to Caffe Niche fairly regularly and continue to explore the menu. We started with the clam chowder (rich, creamy, nice balance of ingredients) and the tomato bisque (so nice on a cold winter night - with just a hint of spicy heat). We shared the Thai Salad and the Pretzel Crusted Chicken. Both were so delicious. We could not finish. I had the Thai Salad the next day and it was even better after it had marinated for an extra 24 hours. Delicious small plates which are easy to share with a group. Another time to the same place.. But different? Both yes and no! Niche changes a bit every time I go so the new gets added to the old excellence. Nice little neighborhood restaurant. Was able to get a Friday night reservation at the last minute. Atmosphere was what we were looking for...neighborhood place with a warm feel. Food was good but not great. We were not offered a bread service. The wine pour was shallow and very average wines by the glass at the top of the price range. Service was excellent. We will probably come back. The atmosphere was beautiful, service was great, the food was hit and miss. The medallions and flank steak under seasoned, the Salmon was delicious and the Cheesy Cauliflower soup was the best thing of the night. All four of us could eat that all night. The food was excellent and our server was friendly and helpful. We had a lovely and very tasty dinner! The service was great! And the food amazing! Food was great and reasonably priced for a New Year's Eve prefix. The New Years Eve menu was absolutely wonderful. We eat here fairly regularly and are never disappointed. But for a special occasion, you can't beat it. A wonderful staff and wonderful service. Food was just ok. Service was attentive but slow. And server didn’t know too much about the food. Liv was great! Food is good, and it’s a fun place to eat. 4 stars. Reserved a table for a birthday dinner and waited over 30 minutes for even a drink. After a 35 minute wait for our salads (Which was not very good) we were informed that our ticket was lost after being there that long. Had to go to Andrea Bocelli so just left. The one good thing is they were apologetic and comped our drinks and salad we had. Went to current oyster down the road and got drinks an appetizer and dinner in 15 mins and it was wonderful. Well there are not enough characters to cut and paste the review I left on Google. Perhaps I'll just add the note I just left the owner. You'll get the idea from that I'm sure. And you can read the rest on Google. I'm not a review guy, honestly, this is the first. They left me no choice by not honoring our reservation( sat us at bar after 50 minute wait)called us at 6:18 for our 4:45 reservation, dirty dishes and restaurant, raw food(twice) hassled us about cutting in and seating ourselves when the hostess seated us, noisy and pure chaos atmosphere. "Thanks for having one of your flunkies call and get feedback. Poor thing couldn't write fast enough. The only courageous thing you've done though. But offering a "gift", what a $25 gift card to your place? So you can add insult to injury? What on earth can you offer to give us back our holiday? You had your chance; take care of the people who make reservations. I work 55+ hours a week, promised my wife something nice, I let her choose the place. Regret. Bad days happen I know that, but that was not the case. You had to put out some serious effort to fail at every turn and to such success. You should have planned better, moved people along sooner, allowed no walk ins, and by the time we were there you should have stopped waiting on people yourself, taken charge and apologized in grand fashion as you turned people away. You in fact should have probably just closed for good at that point. You may think I'm harsh but you and your staff were too busy to even see the beyond horrible experience we had. I have walked out of restaurants before, I have had poor service and bad food. You beat all that and then some. I have never written reviews before, not that guy. You left me no choice. I would have left right as we got there and were told and hour plus wait, but where to go at 5pm on Thanksgiving? My wife wouldn't hear of it, she does not give up, she trudges through and this time to our deepest regret." This was my first time at Cafe Niche. When I took my first bite of the Croque Madame my first thought was this is absolutely delicious. The combination of ingredients and preparation was perfect. My second thought was I’ll be back here again soon. We loved the ahi tartare as well as the turkey dip. Service, ambiance, and food were all excellent. It’s refreshing when you step into a restaurant and with each element of the space, people, and menu you experience you think to yourself that some team of amazing humans as thoughtfully crafted this experience. We hadn't been to Cafe Niche in a couple years, but a friend suggested it. We had such a great experience it left us wondering why it had been so long since our last visit. The service and food was excellent! Great ambiance too! We'll definitely put this place back into our regular rotation. The food here is outstanding. A great variety, some downhome comfort food, some clean and healthy. Brunch is one of the best around, with options ranging from salads and sandwiches to sides of vegetables to corned beef hash and veggie scrambles and croque madame. Topped off with homemade English muffins, biscuits, etc. Along with really tasty bloody Mary’s and any other drink you could want on the planet. Service is super friendly, and outdoor seating is lovely in the summer. I only didn’t give it five stars because the ambiance inside leaves something to be desired. Lots of windows, but I still feel like it’s a bit hard and cold and meh. But overall, highly recommended.